Progress. Handing out free iPods was not going to do much (except attact applicants? ), as Duke learned. Handing out iPods to courses that have some pedagogic use for them makes more sense. The Duke Digital Initiative looks like it has some interesting resources. courses can now borrow the devices for the duration of the term. $99, about one-third of what it would cost retail. Thank you, Steve McClure, for gracing Omie Drawhorn’s story about the Feb. 22 Moscow Planning and Zoning Commission hearing with the “Yes Moscow/No SuperWal-Mart” button. Thanks to Jerry Schutz for pointing out that the hearing was not about one retailer; it was about the direction for Moscow. When I got home from that meeting, I found a letter sent to my wife from her Camp Fire leader of 35 years ago. She reported having a Yes/No bumper sticker and enclosed $50 to help the cause. Thank you. And to other anonymous donors who have walked up and handed me money because we’ll need it. Thank you. I should have known fighting Wal-Mart would be satisfying. It’s the “Yes Moscow” part that reframes the challenge into building our community. I’m a timber framer. 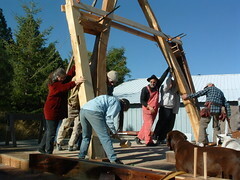 I do barn raisings for the joy when a community comes out and works together, doing something none could do alone. The morning after the P&Z meeting, I realized I’d witnessed a raising of another form. Thanks to the 100-plus people Drawhorn describes, and quotes, who came out and built an argument against the rezone.